When I did the planning and started the construction of my recent Classic French Jacket, I really thought I would be making a pale blue linen sheath to wear with it, using fabric already in my collection. 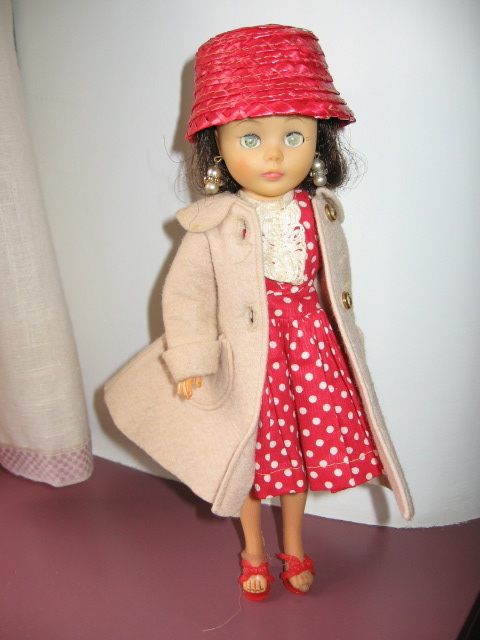 But somehow that pink accent in the weave of the boucle, the trim I selected, and the buttons, all conspired together and changed my mind for me. Fortunately, I also had a piece of pale pink linen in my fabric collection (at this point, I might ask myself, what color linen do I not have in my collection? But let’s not go there….) By this time I had already decided I needed to figure out a way to show that gorgeous lining silk in my jacket, rather than having it solely hidden inside. Having seen accent scarves paired with Chanel jackets on Pinterest gave me the idea to make a scarf. 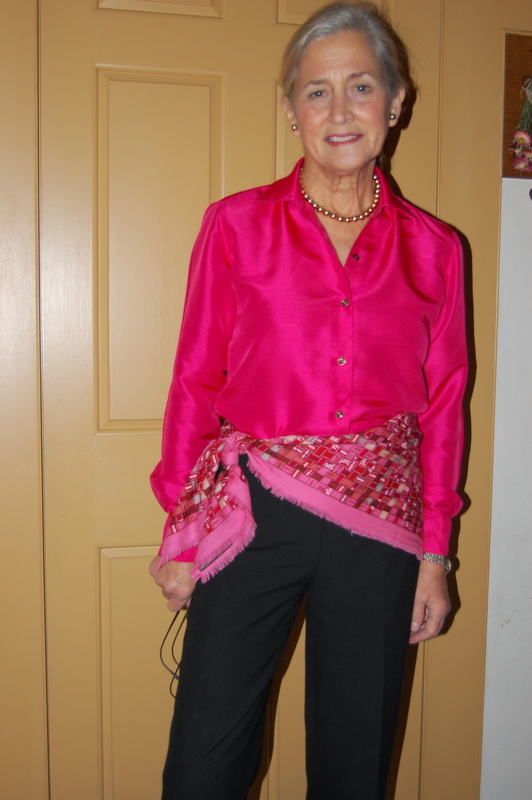 Then I thought it might be fun to “attach” the scarf to the pink (planned) dress in some fashion. I came up with buttoned shoulder tabs as a possibility. I had purchased eight small buttons for my jacket – three for each sleeve and one for each pocket, long before I had this idea. You might recall in my last post, that I decided to make the sleeve vents for two buttons instead of three? That’s where I found/got the two buttons I needed for shoulder tabs. I ended up liking my two button vents! The first tabs I made just did not look right. First of all, they did not turn well, with a pleasing curve And when I placed them at the neckline of my dress, all I saw were the seams. I even finished the bound buttonholes before deciding I didn’t like these. I had to think through lots of possible solutions and finally had a eureka moment when I thought of piping the edges. Piping makes the sewn curve much easier to turn well. I placed the tabs slightly forward rather than exactly on top of the shoulder seam. The rest of the dress was very straightforward, as sheath dresses tend to be. It is lined with a lightweight, cotton/linen blend, but I did not underline it, as I like to preserve the washability of most of my linen garments (easier without an underlining.) It is also cooler without an underlining. Being a lover of pink, I already had pink pumps that match the dress exactly – and a handbag which brings out the peachy part of the pink in the boucle. The tabs on this dress give it kind of a ’60s vibe. Unintended, but kind of a nice touch to go with the jacket. 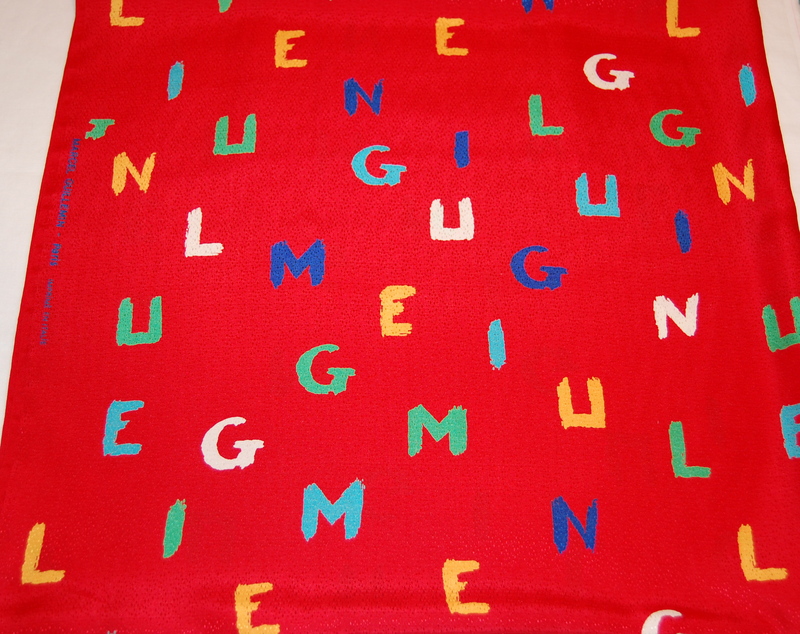 Boucle: Mendel Goldberg Fabrics , NYC, gift from my grown children. Handbag: Kate Spade, also old. For a number of years now, Thursday evening has been “date night” for my husband and me. That’s what we call it, but it really just means that we always go out for drinks and dinner. It is always one of my favorite nights of the week. Part of the fun of it is the “standing reservation” we have at a favorite local “drinkery/eatery”, where we are always met by friendly staff and a “kitchen” that knows our favorite choices. Because we so often go to this same place, I like to mix up what I wear. I doubt anybody actually notices, but it is just one of those things which is important to me! Anyway, my new blouse is going to be a colorful, welcome addition to my Thursday night wardrobe. 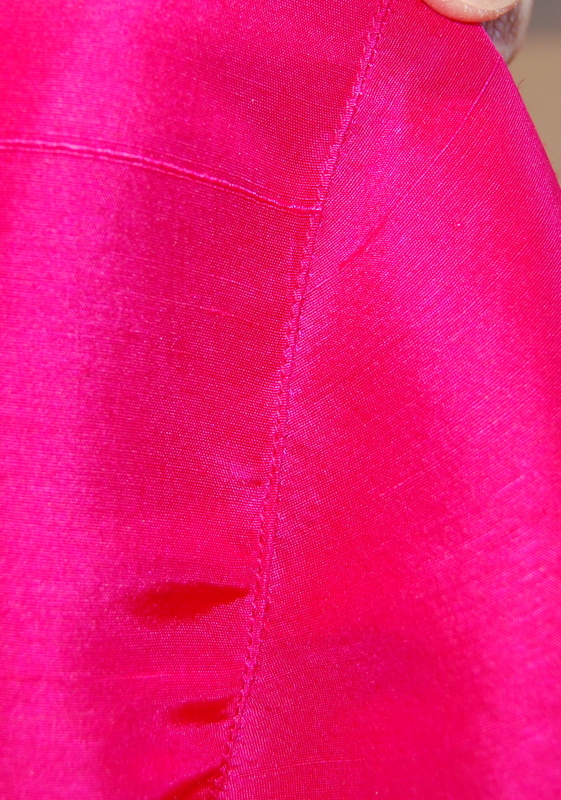 Made from pink silk which I purchased in the 1980s. 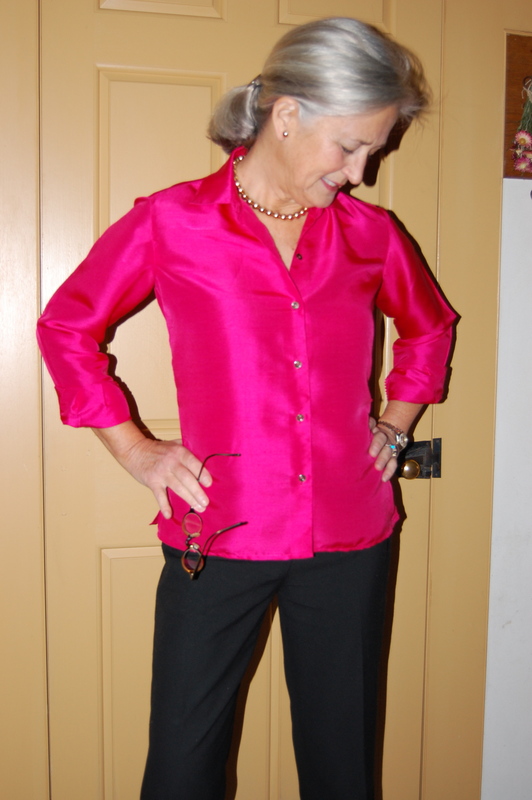 Of course, I wanted to start with a basic blouse pattern, which I could tweak to recreate my old favorite one. 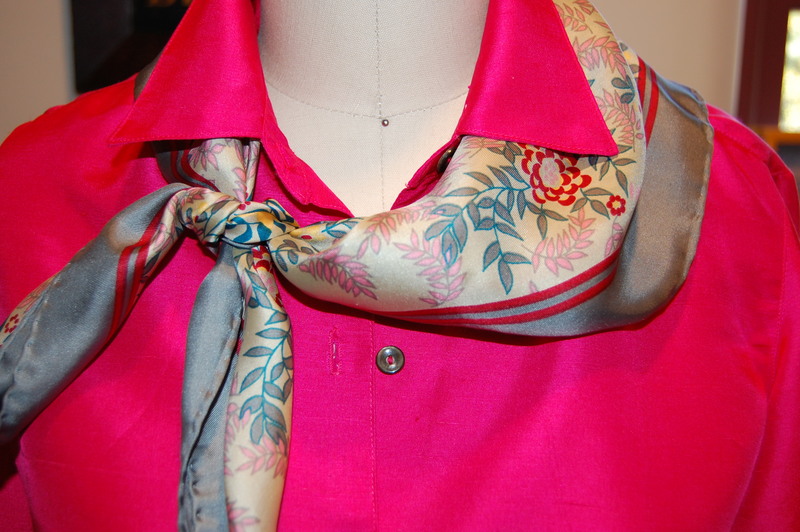 At this point, you might ask, “How difficult can it be to find a basic, long-sleeved, banded collar blouse pattern?” A lengthy search through my patterns produced exactly one with some of the lines I wanted. Just looking at it kind of made me cringe. But then I realized that, with certain changes, it would probably be just about perfect. 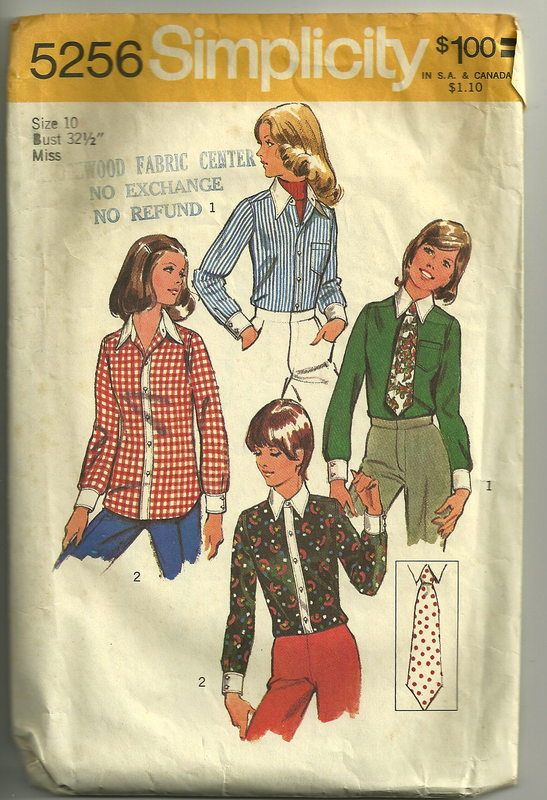 Copyright 1972, this Simplicity pattern looks about as dated as it is, but its “bones” are still good! 1) The collar band was much too wide, so I narrowed it by about 50%. 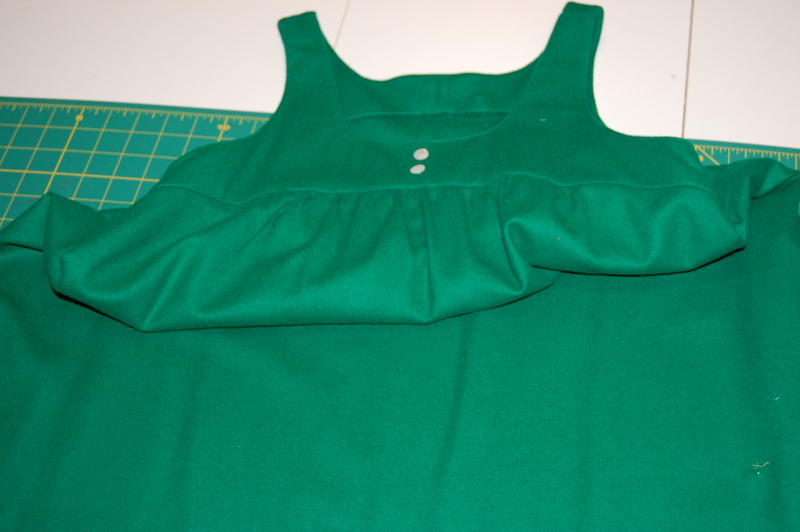 2) The collar was too big and too pointed, so I redrafted it to match the collar on my green blouse. Changes to the collar band and the collar. 3) I eliminated the back yoke. 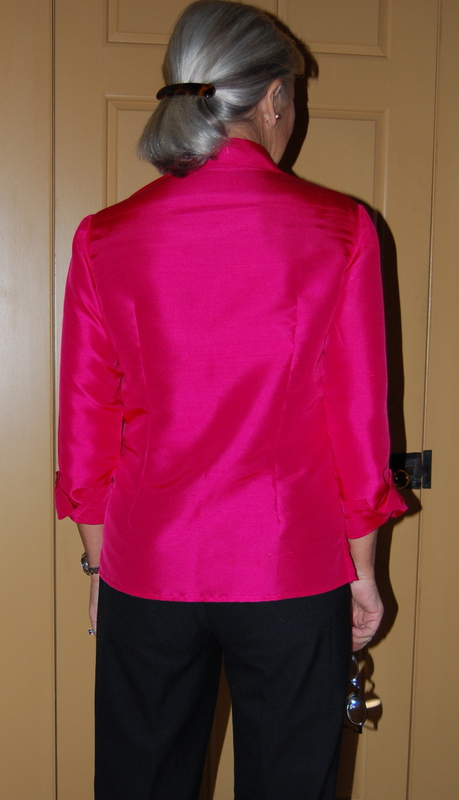 4) I made the front and back pieces a little straighter at the side seams, and then added two darts to the back to take in some of the fullness and make the blouse curve over the hips a little more flatteringly. 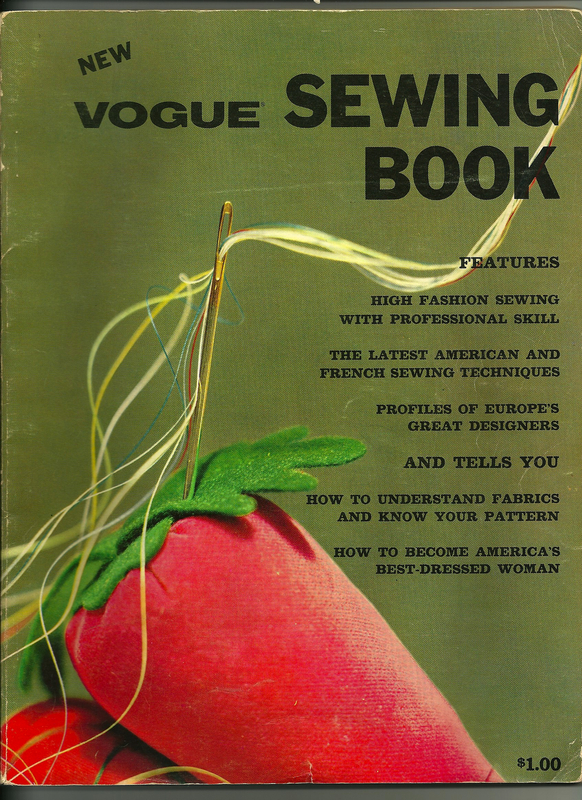 5) I loved the “sportshirt” sleeve plackets on my green blouse, so I went to my 1972 Vogue Sewing Book to find out how to add them to this blouse. I narrowed the cuffs, too. I practiced on muslin first! I am fairly happy with how these plackets turned out. I can’t ever remember making this type of placket before, so I guess it was a first for me! 6) I eliminated the front button band. 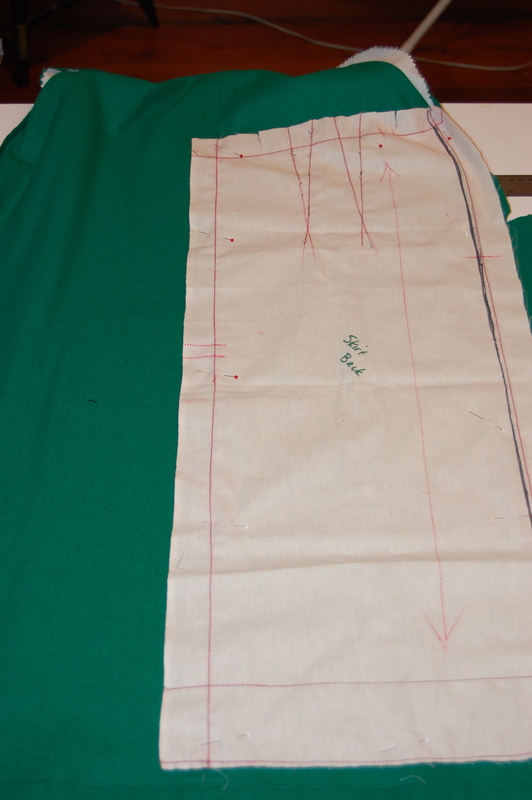 7) I added side slits and narrow topstitching to all the edges, just like on my green blouse. 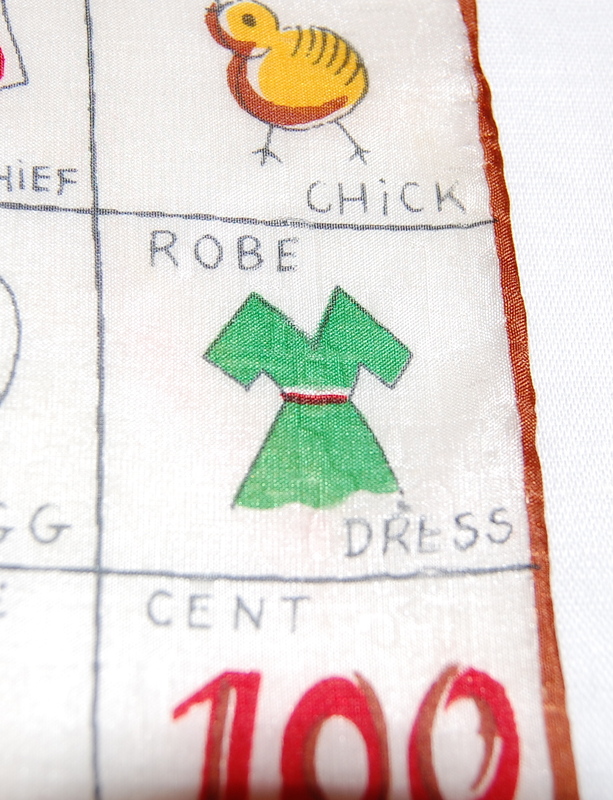 This shows the sleeve heading, which I narrowly topstitched. Click on the photo for a better look. Here is the topstitching on the front edge. Oh, there is more, but you get the idea. I made a permanent record of all these changes with a whole new set of pattern pieces. 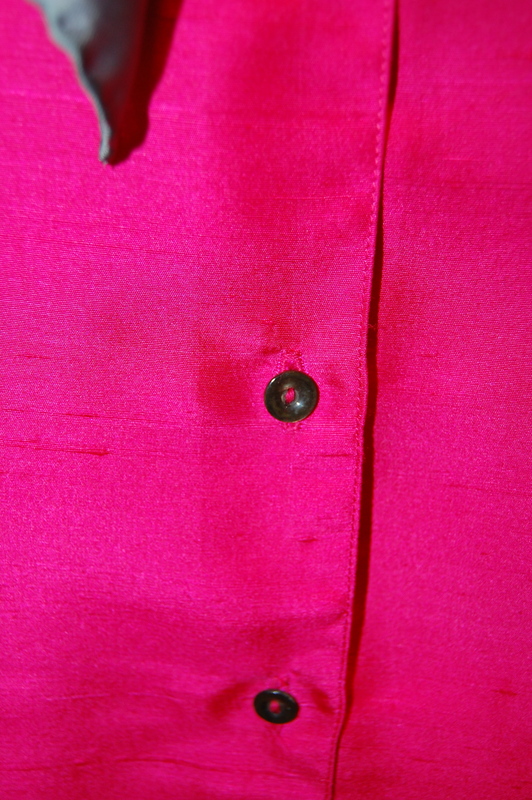 When it came to choosing buttons, I hoped to find some vintage ones to compliment the bright pink. I found this gray pearl set (picked up somewhere for 50 cents), and the iridescence in them shimmered a bit of pink. The holes on two of the buttons were a little off center, but fortunately, I only needed 8 of them! 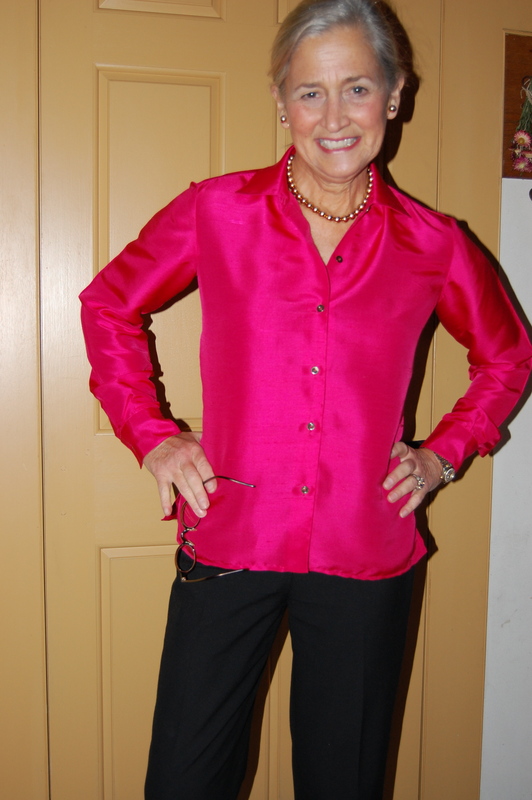 The process of making this blouse was fun and low-stress: I interfaced the collar and cuffs with silk organza, of course, but other than that, there were no underlinings, no linings, no bound buttonholes to worry about! 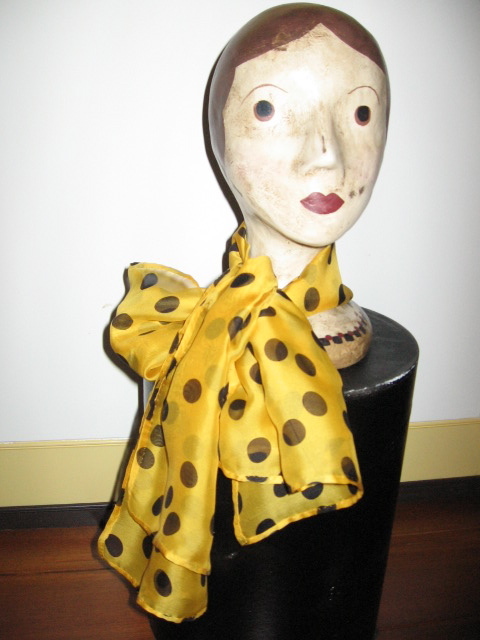 With a cashmere blend scarf, for a dressier look. 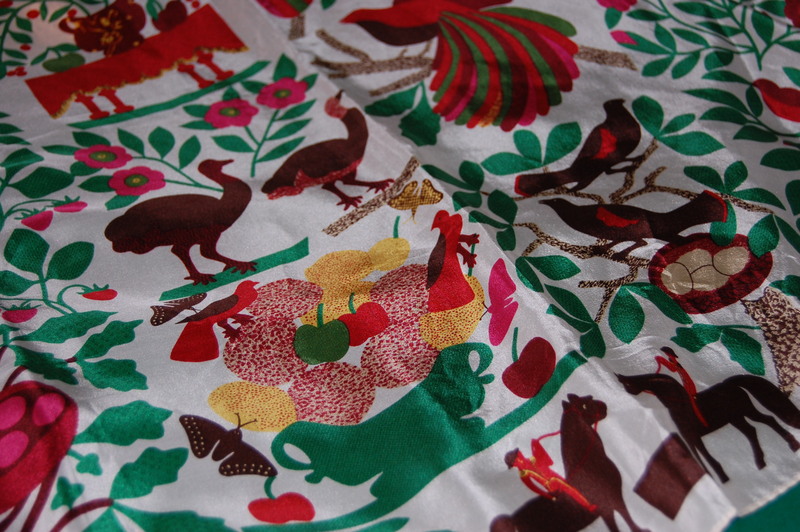 A vintage scarf to go with this vintage fabric! I’m looking forward to wearing this blouse often, but especially for date night, which just so happens to make “date day” also fun and low stress: no dinner to plan and cook – which means more time in the sewing room! 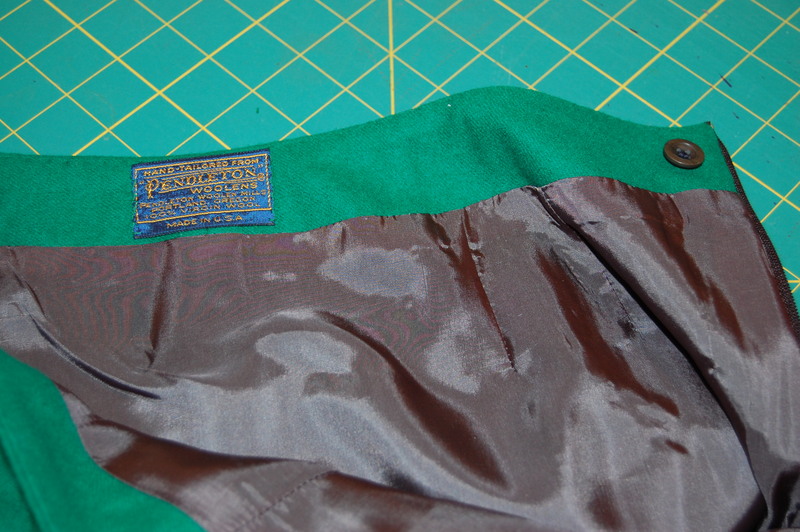 I am finally back in my sewing room, working on my emerald green silk suit. The event to which I had hoped to wear this suit has come and gone (I wore something else that evening and the world somehow kept on spinning – amazing! 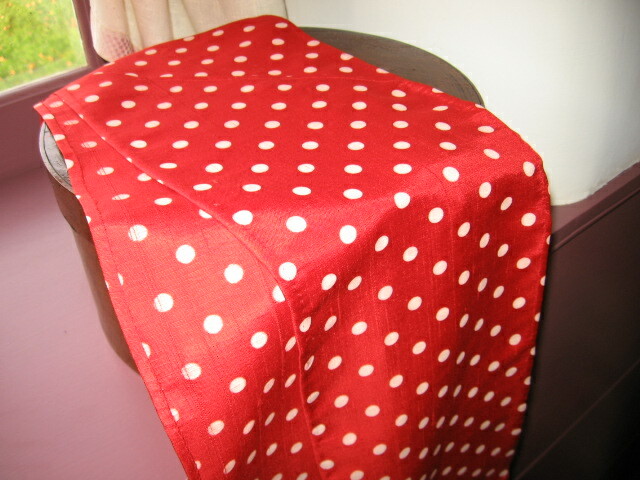 ), but this sewing project was and is on my Spring agenda and I am bound and determined to finish it. 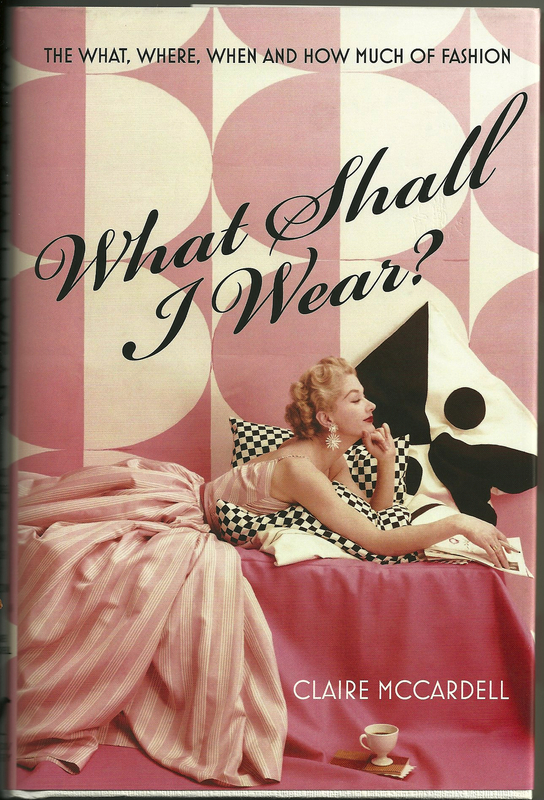 Until I have made a bit more progress, with something to show for it, I thought I would indulge you with a book review of the 1956 Claire McCardell (1905-1958) book, What Shall I Wear, re-published in 2012 by The Rookery Press, in association with The Overlook Press, New York, New York. This book came to my attention by way of The Vintage Traveler blog (thanks, Lizzie!). I purchased it on Amazon last Fall, and then, to my surprise, it was one of five books chosen by Christina Binkley of The Wall Street Journal for her annual list of “Best Style Books”. 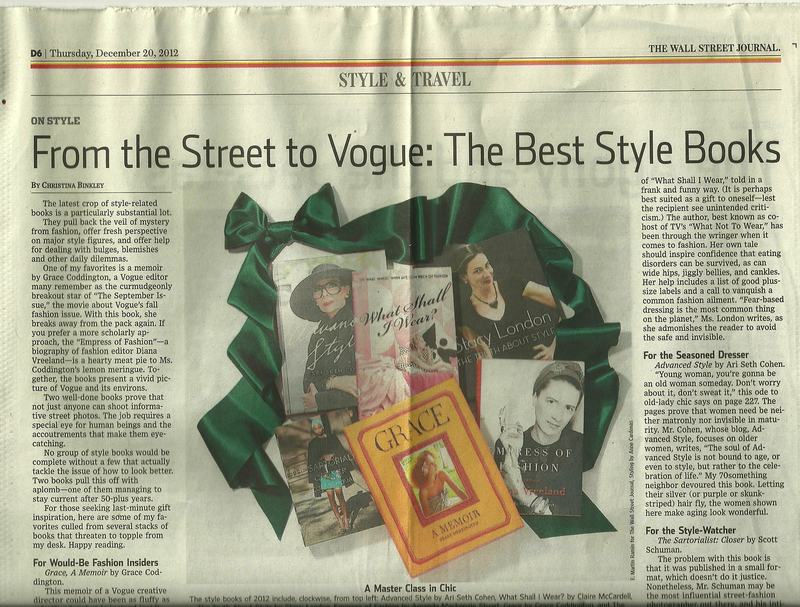 This annual feature on “style books” in The Wall Street Journal is always one of my favorites. It appeared on December 20, 2012. 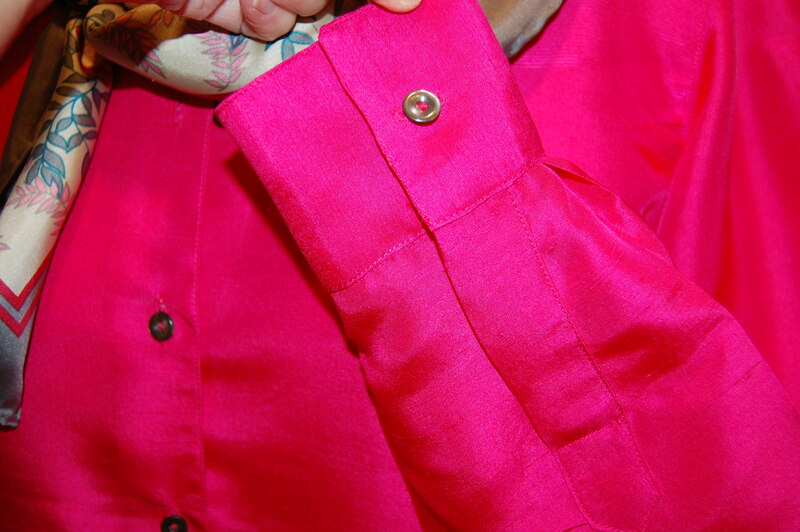 1) The simple act of changing buttons (or in sewing, choosing the right ones) can make a dress fit your style. 2) When putting together your clothing (or pattern and fabric) budget, consider carefully where you want to put your money. Make one major purchase a year, something classic and timeless is always a smart move. 3) Use color extensively and don’t be afraid to stretch from your normal palette. 4) Coats should be a large part of your wardrobe. Indeed, she recommends compiling a “Coat Collection”. That’s advice sweet to my ears! 6) Like all the great fashion designers and couturiers, she emphasizes the overwhelming importance of fit. All those muslins/toiles we make are worth the time they take! 7) Accessorize your outfits with the appropriate jewelry, shoes, and bags. Restraint is better than opulence. 8) She was a big fan (and proponent) of the “American Look”: meaning comfortable clothing with clean lines, displaying elegant simplicity. 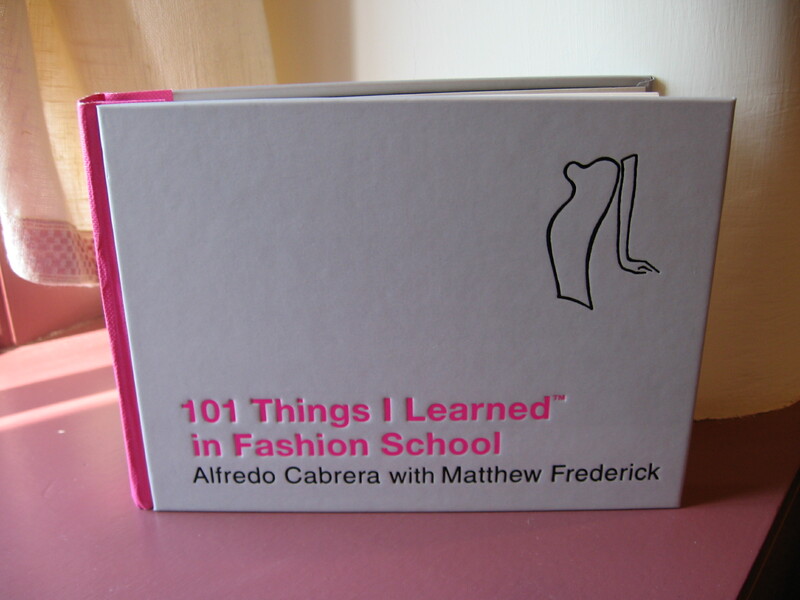 The final chapter of the book is appropriately entitled: Fashion has no last chapter. You can read here for yourself her Essential Eleven. Pay particular attention to #2! As a preface to this list, McCardell states: “There is a great deal in common between the woman who designs clothes and the woman who knows clothes.” (Click on the photo for a close-up). 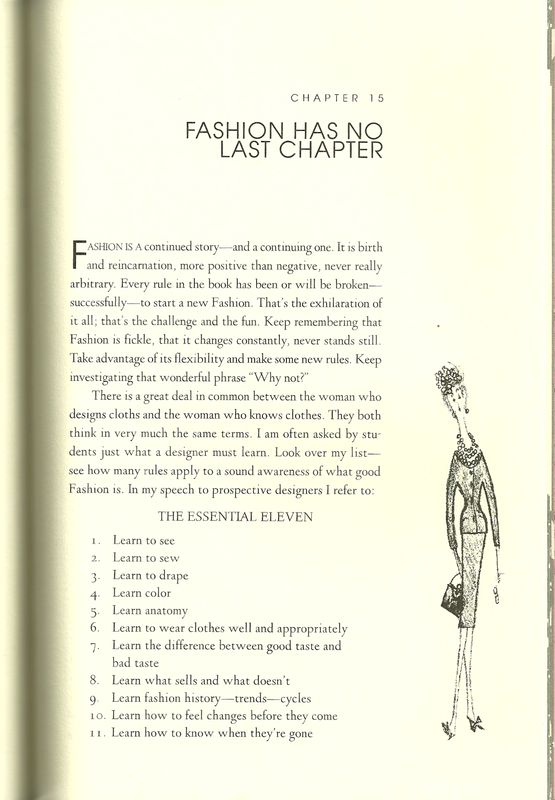 Surely sewing and dressmaking have no last chapter either: What will you wear? What will you sew? 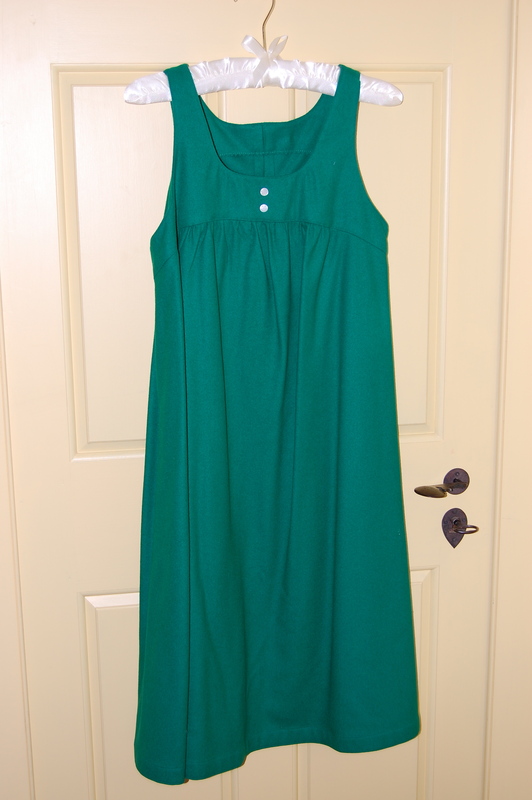 I made this maternity dress in the Fall of 1980 while pregnant with our first child. The fabric is US-made Pendleton wool. – had Emerald Green not emerged as THE color of 2013. As it was, it seemed silly not to take advantage of this opportunity to make a skirt in a color I love, from a dress that would not be worn again, and which already carried sentimental memories. So I told myself repeatedly, “Do this.” And so I did it, but not without much mental anguish. Before I did any ripping of seams or cutting of fabric, I needed to decide what kind of a skirt I could make, knowing that, even with a maternity tent-style dress, the usable expanse of fabric was limited. 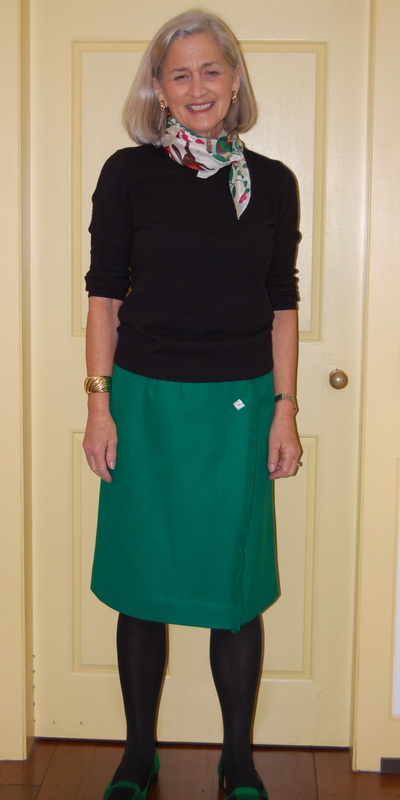 It seemed fairly obvious that a pencil or A-line skirt was about the extent of the possibilities. But I wanted some kind of a focal point on it, too. I kept thinking about the fringed Pendleton wool skirt that I had remade, thinking that fringe on this green one would be quite nice as well. I did a little testing on an inside seam of the dress and determined the wool was so tightly woven, that any “fringing” would have to be somewhat minimal. It also seemed to be easier to unravel the threads working up and down rather than across. I figured if I could wiggle out enough fabric to add one overlap (or pleat) at the side front, I could fringe that edge and get the focal point I wanted. 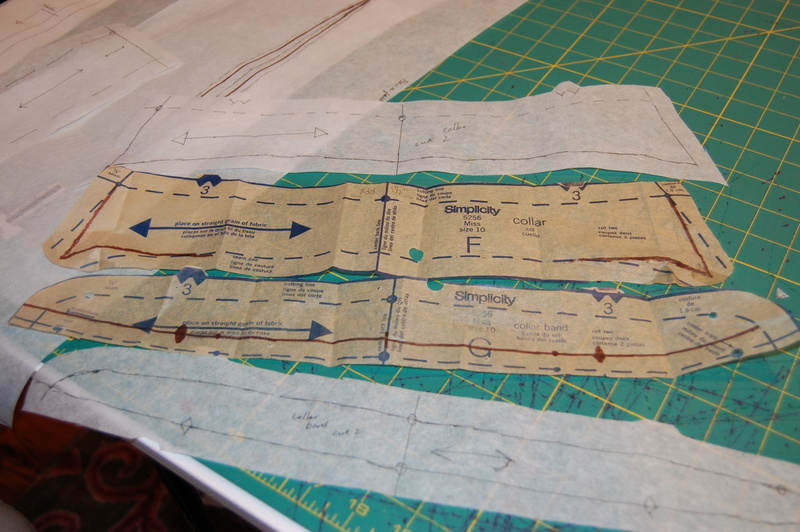 With this plan in mind, I now had to face cutting apart – and into – this dress, which I so clearly remembered making and wearing over 31 years ago. Honestly, for a couple of days I really couldn’t face this. My practical side finally triumphed when I decided I would first separate just the side seams on the dress. If I chickened out at that point, I could always sew it back together, right? Right! And so I snipped and snipped and pretty soon I had two usable sections of wool. The dress with the side seams separated. Then – somehow, miraculously, I was suddenly okay with the thought of cutting into this dress. 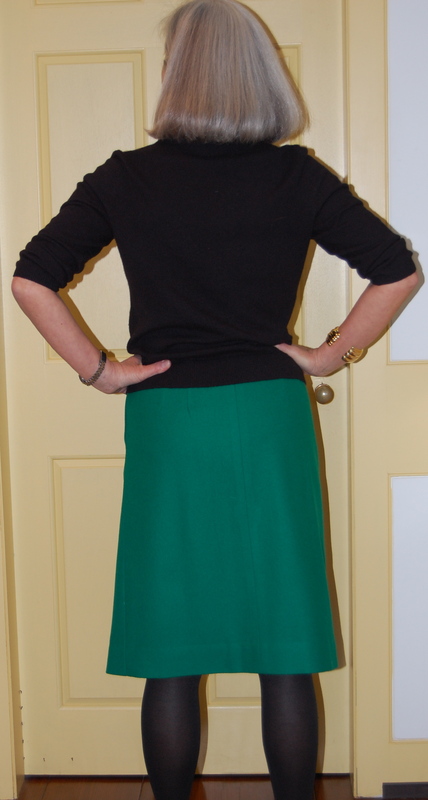 The back part of the skirt pattern fit perfectly on the back section of the dress – it was even already seamed for me. My muslin pattern positioned on the back of the dress. The front part of the dress gave me enough room to make a new two-piece front, with a pleat on the left side. I cut out the pieces and set about to fringing. Re-runs of Downton Abbey helped tremendously with this – I pulled and picked and created fluffy little towers of green threads while totally absorbed in another time and place. 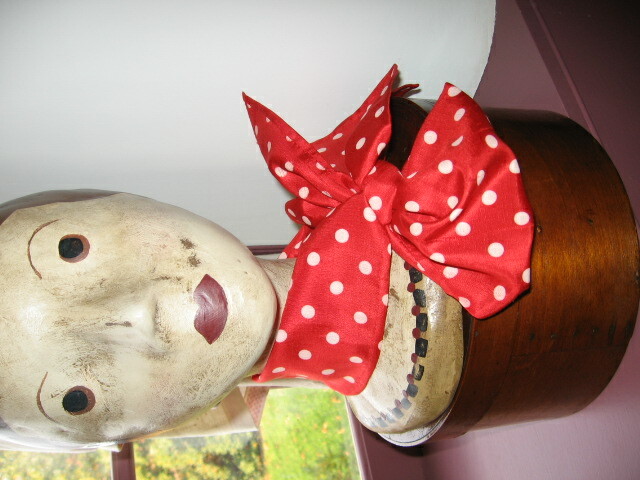 Then it was back to the sewing room to sew this baby (pardon the bad pun) together. There was not enough fabric to fashion a waistband on the straight of grain, so I opted to make an inside pieced-together facing instead. The facing at the waistline. I attached the 31-year-old Pendleton label in place after all these years! 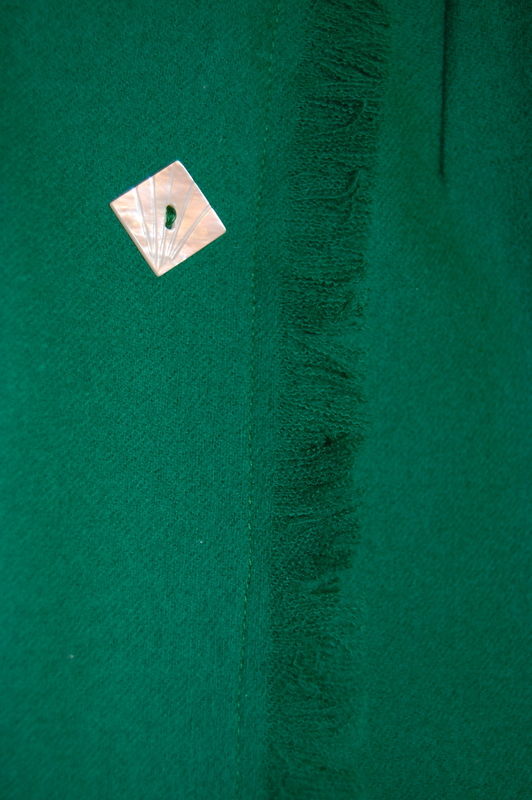 Then I made a button tab out of bias tape which I just happened to have on hand in emerald green. 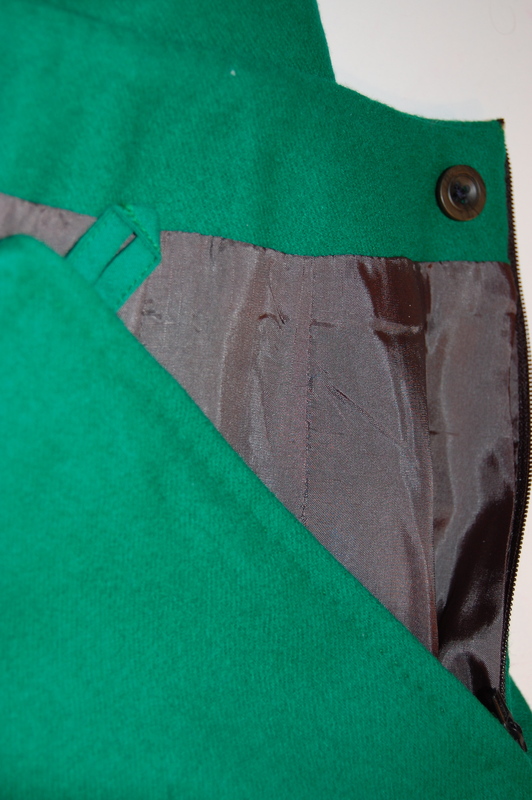 What I could not find was a 7” zipper in emerald, nor lining fabric in emerald. Guess the manufacturers of such items did not get the memo from Pantone about the color of the year! So I ended up with a black zipper and dark gray Bemberg lining fabric. The fringe detail on the pleat – and the single button. Sure wish I had another one of these! It’s finished (except for the button issue, of course!). How I love these comfy flats! 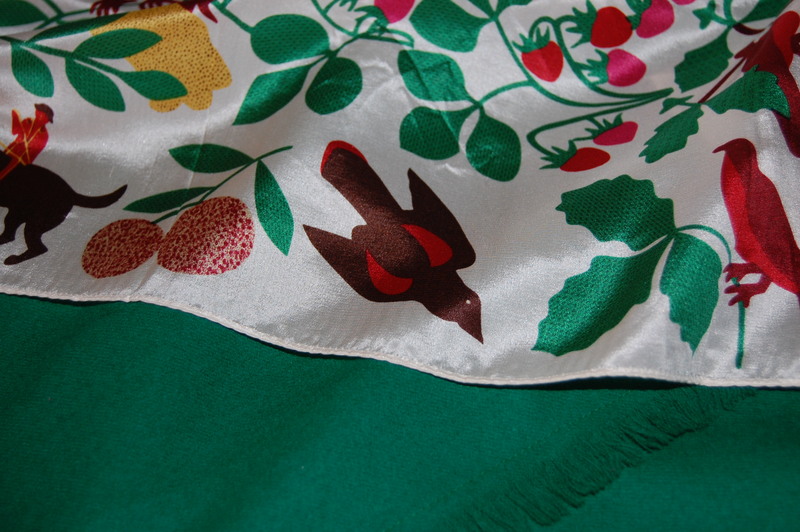 And among my collection of silk scarves was this scarf, purchased in the 1980’s from the Museum of American Folk Art, featuring one of their quilts in predominant colors of pink and – yes, Emerald Green. The green in this scarf could not be more perfect. 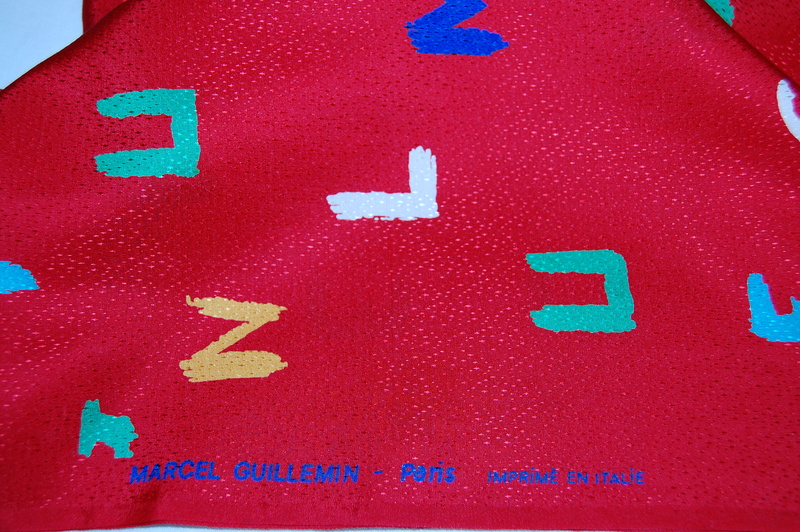 A detail of the scarf on top of the skirt. So – where do I envision wearing this skirt? How about to a baby shower for my daughter, now expecting her own little one? After all, she herself was once sheltered by these warm woolen threads of green – and love. Unfortunately I do not – yet. 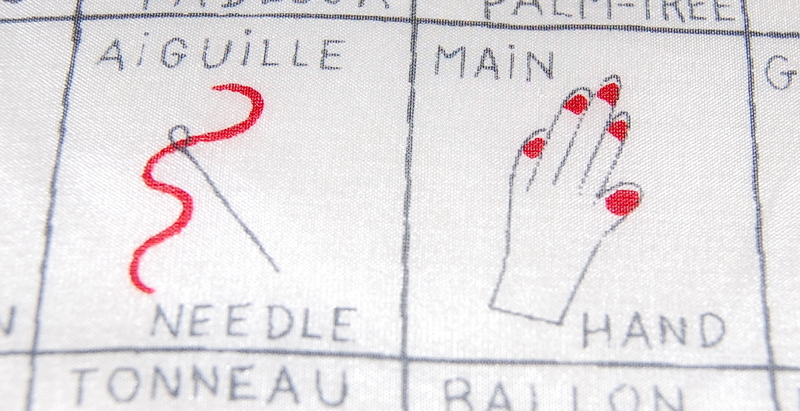 It is undeniable that French is the universal language of fine sewing. 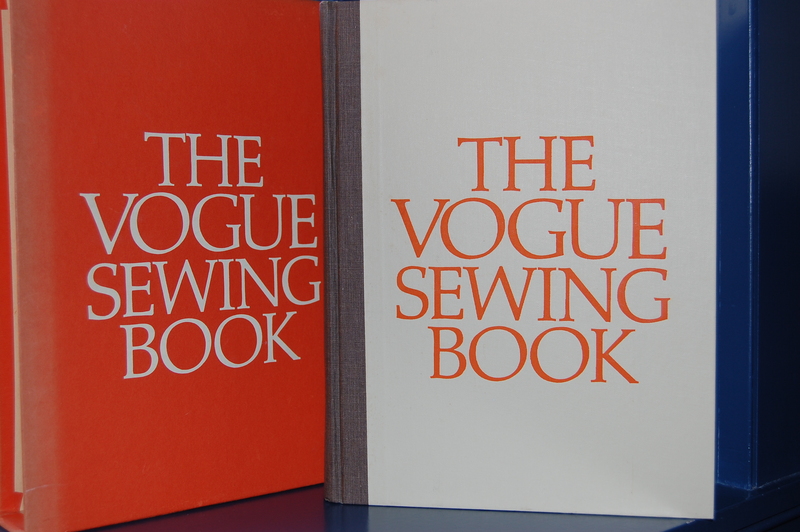 I have found myself often going to my copy of The Vogue Sewing Book (copyright 1970 by Vogue Patterns, New York, New York) to check translations and pronunciations of certain French fashion terms in the list at the back of the book. Notice the price on this paperback book: $1.00! I just assumed that this list would be the same as the one in the hardbound book I already owned. Not so! While there is certainly some crossover of terms (such as the common ones: au courant, boutique, couturier and couturiere, chic, haute couture, vendeuse, volant, etc. 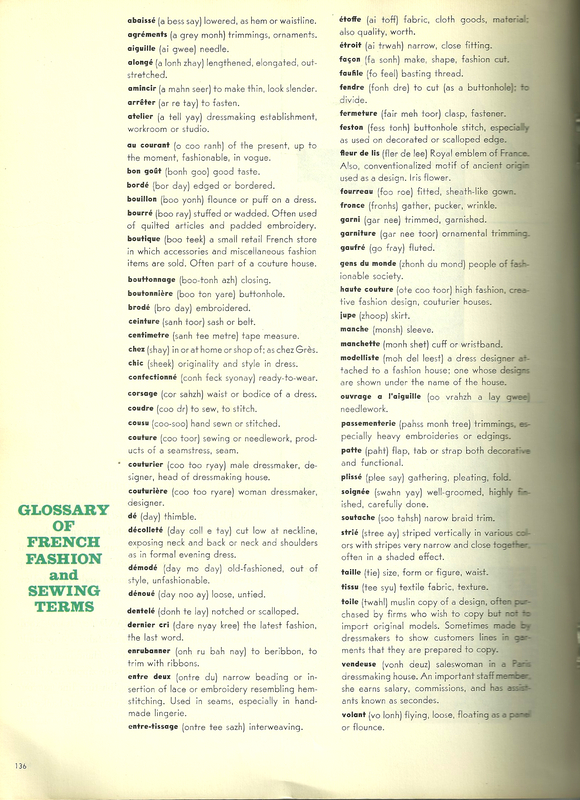 ), other terms appear on only one list, such as amincir (1963 book, meaning “to make thin, look slender”), gens du monde (1963 book, meaning “people of fashionable society”), and chemise (1970 book, meaning “blouse or style with manshirt details”). 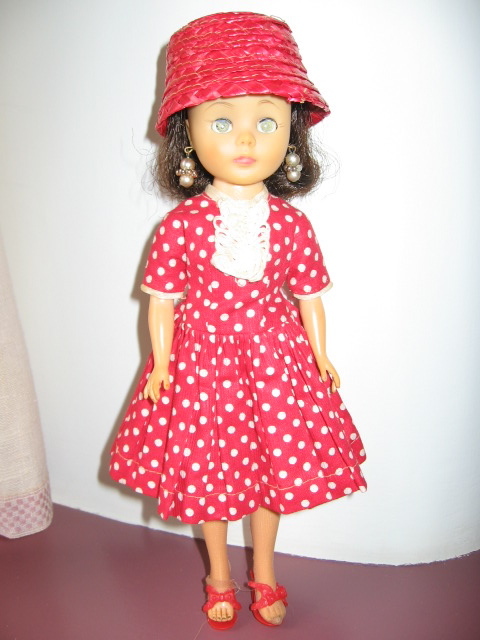 At least one term is two variations on the same meaning – and very much in our vocabulary today: confectionne (1963 book, meaning “ready-to-wear”) and prêt a porter (1970 book, meaning “ready to wear”, but with this addition: “more current than ‘confection’”). It’s quite appropriate that the needle and the hand are side by side. 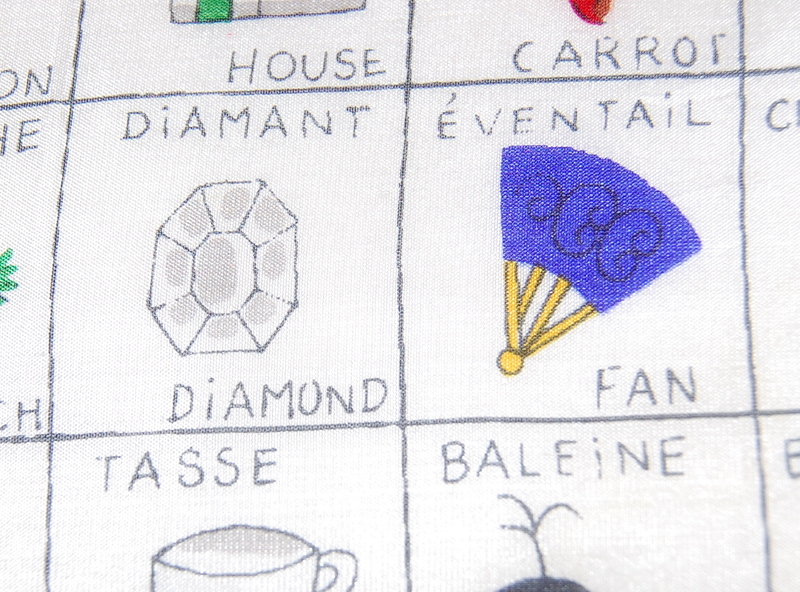 A diamond and a fan to complete your outfit! A lustrous crepe de chine. It is plans like this and some of those beautiful French fashion/sewing terms that help to inspire me to become a better dressmaker. Something else, too, is inspiring me to dare to think of myself as being my own “couturiere”: my enrollment and active participation in The Couture Dress, on online Craftsy course taught by Susan Khalje. 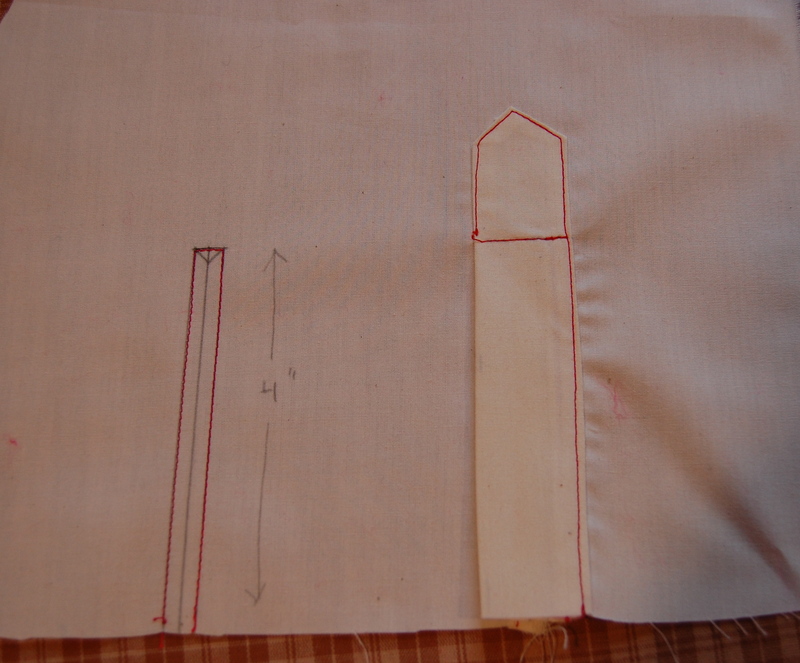 I am currently working on my muslin (also known as “toile”) for my version of the class-suggested “fourreau” (fitted or semi-fitted, sheath-like dress). 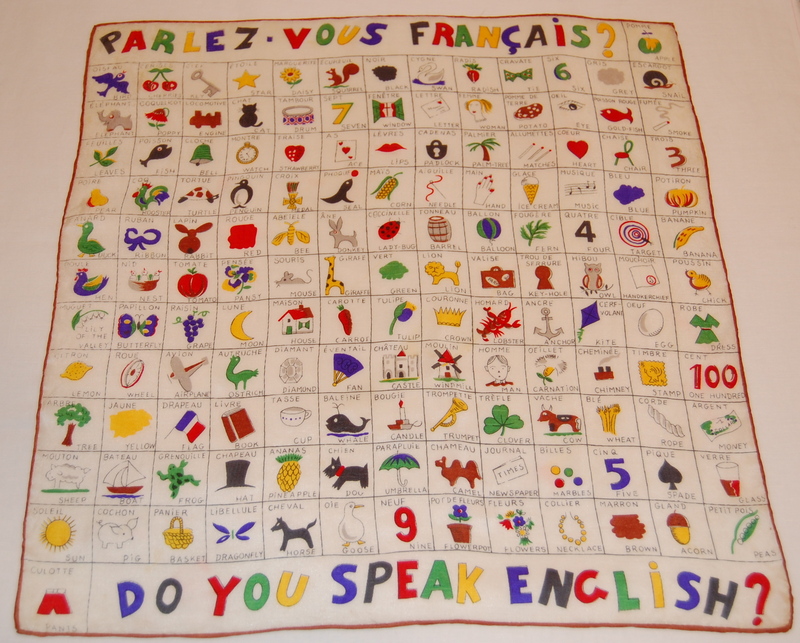 I may not be thinking in French yet, but I am definitely dreaming in it! This dress could easily have been featured in Vogue Pattern Book for February/March of 1957! I cut the silk into two pieces, each with a true-bias end. I marked it with chalk to get a precise cutting line. 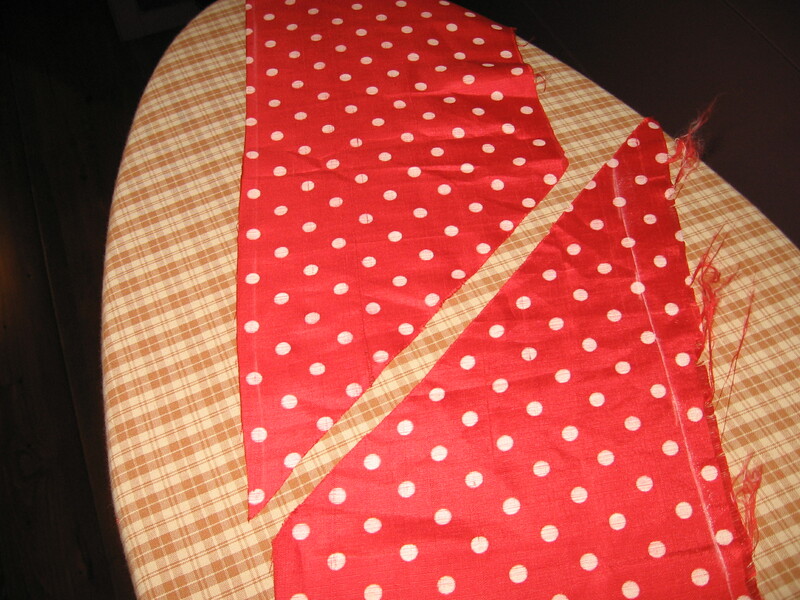 I joined the two pieces together with a flat felled seam and hand-hemmed around all four sides. Here it is finished and ready to wear. Last summer when my husband, Tom, and I were in California to see our son, Nate, I made a memorable trip to Britex Fabrics on Geary Street in San Francisco. I knew when I saw this fabric, I wouldn’t be able to leave the store without it: pure silk charmeuse – by Dolce and Gabbana, no less! Here it is propped over two pegs. They also carried the matching silk chiffon. 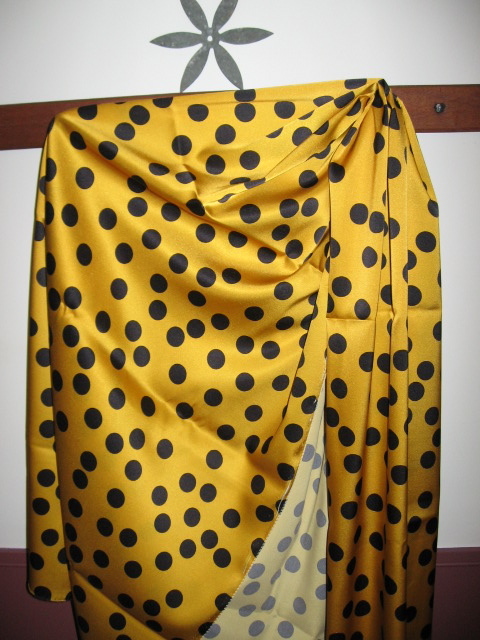 I have been looking for the right pattern to make a blouse out of the charmeuse, and the chiffon is now this scarf, which gets comments whenever I wear it! In my opinion, dots are stars!